I think I’ll just call this post “Pulled Pork.” Why the hell not. Did you sample Uncle Bob’s Nuts? And did you smell hot dogs? You know good and well we had mini-donuts. They weren’t handing out samples – you had to PAY to get a taste of Uncle Bob’s Nuts. Captain Paw Paw’s? I don’t remember this episode of Super Friends. Let’s see…Dr. Palagian, King Plastos, Professor Goodfellow…nope, no Captain Paw Paw. He must be later. I saw a bait shop near Naples Florida once called “Master Baiters” but I suppose they did that on purpose so I’ll just shut up now. Part of me respects naming it Master Baiters and then part of me thinks they must have spent 30 whole seconds coming up with their name. 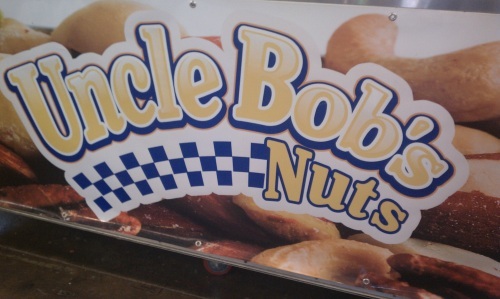 Uncle Bob’s Nuts has to be on purpose, right? More proof that people just don’t think. Too funny! 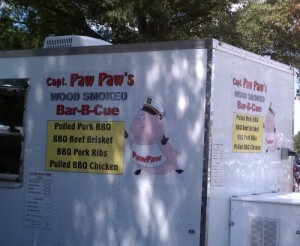 I’m hoping that Captain Paw Paw is a grandpa who was also in the Navy or something. Wait . . . Pulled Pork? Oh, I see what you did there. Bravo! 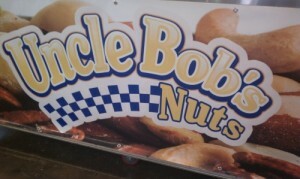 Unfortunately, there are probably many out there who HAVE tried Uncle Bob’s Nuts. I imagine they would also call him Uncle Paw Paw. Was this flea market run by the Association of Pedofilia, LLC? At a RenFest once, the guy selling the nuts kept asking if my friend and I wanted to taste, munch on, lick his salty nuts. We declined. He may have been carrying roasted nuts, but he took it just a bit too far. We were in middle school. Yeahhhh, that dude has got to be in prison by now. I hope I see that guy this year when we go back. I will be kicking him in his salty nuts, in retaliation for doing that to middle school Thoughtsy. OHMYGOD I just fell over laughing, which is not good since I’m on a con call for work and I *should* be paying attention. I had an Uncle Bob (he was actually a great uncle, and I think he’s now dead… though he divorced my great aunt so I don’t really know…) and he had nuts. He was one of those guys that would wear very loose shorts, then sit across from you and cross his legs by putting one foot up on the other knee. You know, wide-open crotch. WITH VERY LOOSE SHORTS. And perhaps no underwear? I don’t know… I just know that when I saw Uncle Bob sitting outside with his legs crossed, I did my best to NEVER sit across from him….